The alluring beauty of the Garden Island will charm your spirits as you are surrounded by Kaua`i's majestic peaks, Namolokama and Makana, while being beckoned by the blue expanse of the sparkling Pacific Ocean. Spacious studios and one-bedroom villas offer generous guest rooms adorned with Hawaiian cultural décor that invites you to relax and rejuvenate. The private lanais and countless impressive amenities will enhance your distinctive Hawaiian retreat. 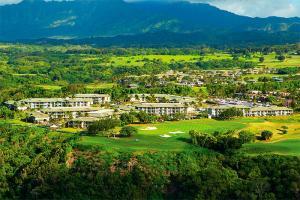 Located within the Princeville community on Kauai's north shore, 200 feet above the Pacific Ocean. All villas feature full kitchens. A general store and deli is located on the property. Makai Golf Course, Prince Course, Wailua Municipal Golf Course.